This is adapted from the Ottolenghi book “Jerusalem”. I’ve added some preserved lemons, which give the dressing a real sharp flavour. Mix the cumin powder with the harissa paste. Wash and dry the mackerel and cover on both sides with the harissa mix. Cook the beetroot, then peel and chop in a small dice. This will take 30 mins for a small – medium size or up to an hour for a larger one. Crush the coriander and cumin seeds, and add juice of half a lemon and the paprika. Add to the beetroot mix and season to taste. To cook the mackerel, put some olive oil in a pan on a medium heat. Once hot, place the mackerel fillets skin side down and press down in the middle for 10 seconds to stop the fish curling. Leave for about 2-3 minutes until the skin is coloured. Quickly turn over and cook for a further 1-2 minutes. 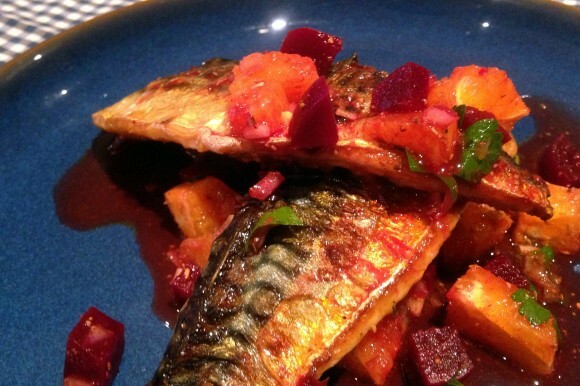 To serve, place some of the beetroot mix on a plate and place the mackerel on top.